CyberConnect2 and Bandai Namco have launched a teaser site for a new mobile game. 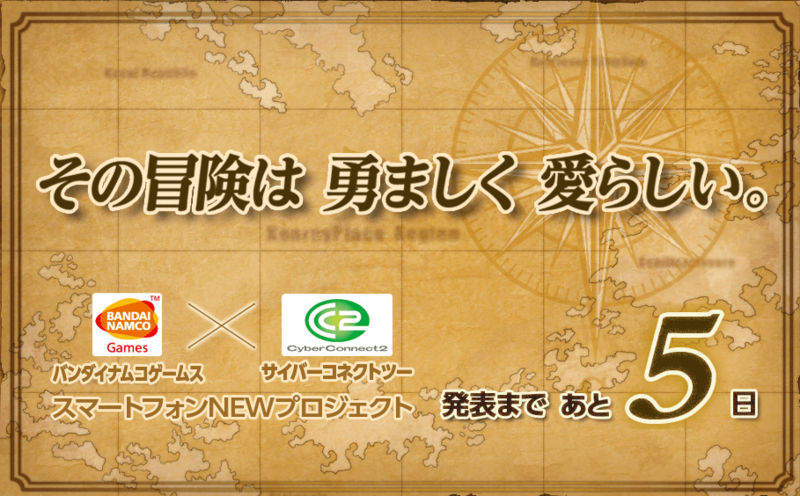 The text reads, “This adventure is bravely charming.” At the time of writing, the site is due to reveal its secrets in about four days. The map in the background reminds me a lot of the one seen in Solatorobo: Red the Hunter. In addition to that, CyberConnect2 have confirmed that a sequel to the game is in the works. That was over a year ago now, so development must be well on its way. And just last week, they filed a trademark for something called Little Tail Story, which I believe could be that sequel. Little Tail Story has yet to be announced, and I believe this countdown website may be the thing that does it. While I don’t mind mobile games, I’m still not totally comfortable with them. Nor am I totally comfortable with the idea of a sequel to one of the more charming titles I’ve played being on them. And yes, it is mobile; our translator Will told us that it explicitly says so. What do you all think it could be? Let us know in the comments, and check back in about four days to see what was announced! Check out the teaser site here.